Denny Hulme won the Monaco Grand Prix, his first championship win, but the day was overshadowed by the death of Italian Lorenzo Bandini who crashed while in second place. After two years without a fatality during a race, the brutal reality returned in an appalling accident witnessed by thousands. Bandini was lying in second when he clipped the chicane, and crashed upside down. His car caught fire, igniting straw bales which lined the track, and as it burned with a conscious Bandini trapped inside, several attempts were made to pull him out but each time the intensity of the blaze beat inadequately equipped marshals back. As cars continued to race past, Bandini was eventually pulled clear but died from terrible burns three days later. His Ferrari continued to burn for the rest of the afternoon. Bandini once said: "If you have to go, if it is written your time is that day, you will die whether you go racing or not." With the field limited to 16 cars, most places were allocated to teams which had been racing for three years or more, leaving the rest to scrap for the eight remaining slots. Bandini led off the line from Hulme, while pole-sitter Jack Brabham broke a connecting rod on the opening lap and soon after spun out on his own oil. After two laps Hulme passed Bandini, and after seven Jackie Stewart took the lead. 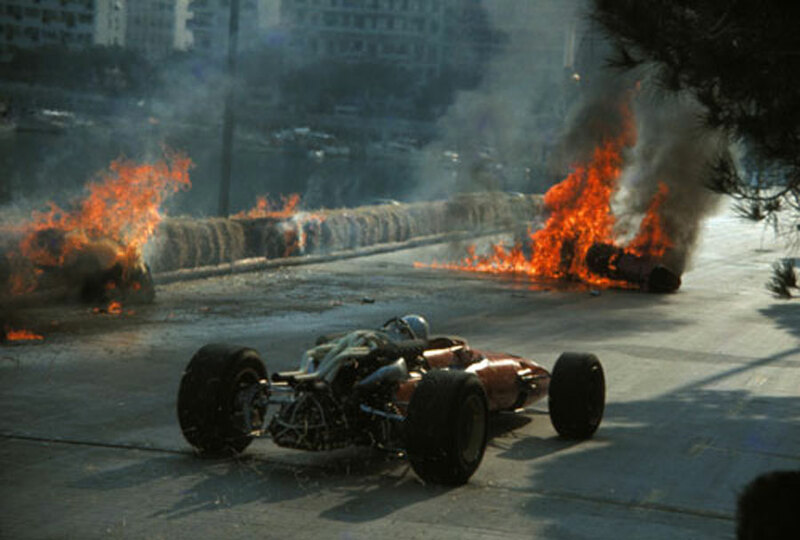 John Surtees moved into third until his Honda expired in a cloud of blue smoke, and then Jim Clark, harrying Bruce McLaren for third, suffered a broken suspension as he took the 90mph left-hander at the Tabac Turn and his Lotus crashed into a wall. By halfway only eight cars remained, and although Hulme led, Bandini steadily ate into the gap. But Motorsport noted that "Hulme's superior physical condition was coming out on top and poor Bandini was beginning to flag and lack concentration, occasionally being untidy and ragged on some corners". But on the 81st of 100 laps Bandini crashed, leaving team-mate Chris Amon in second, but his career-long ill fortune was again to the fore as his Ferrari suffered a puncture - possibly from running over the debris of the smoking wreck - dropping him to third behind Graham Hill.